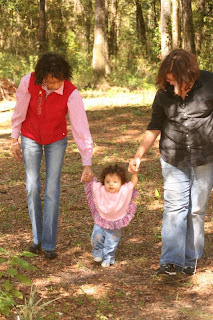 Zoe is taking great strides to learn to walk, everyday she pulls herself up just a little faster and a little stronger. She cruises around the furniture as though she has been doing it everyday of her life. Even her teachers say that any moment she will just jump up and take those crucial first steps. Oh, what scary days lay ahead!! !